This species is widespread and stable throughout the Mississippi River drainage. It inhabits the Gulf drainages from the Ochlockonee River system west to the Rio Grande and apparantly extends into northeastern Mexico, but does not occur in Canada. It is widespread throughout the Mississippi River drainage. In the Apalachicola Basin (formed by Apalachicola, Chattahoochee, and Flint Rivers) of Alabama, Florida, and Georgia, this species is historically known from 120 records from 51 sites including the mainstem and tributaries of the Apalachicola, Chattahoochee, and Flint Rivers and recently in the lower Chipola River. Comments: The washboard is the largest and probably the longest-lived freshwater mussel in North America. The shell exterior is nearly black and roughened (like a washboard) with ridges and grooves. Young washboards have a noticeable zigzag sculpturing in the umbo area that over time erodes to a smooth surface.It could be confused with large threeridge shells. Using growth-rest lines (rings) as reference, some authorities believe these mollusks can live over a century. 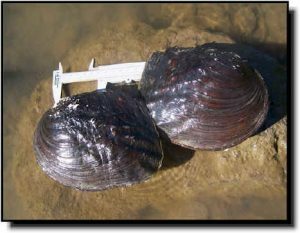 Also, these mussels have been located in several archeological sites suggesting Indians used these large shells for plates, hoes or scrapers. The females release glochidia in late winter. There are several potential fish hosts for this species in Kansas rivers. 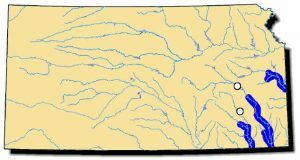 The washboard can be found in the Marais des Cygnes, Fall, Verdigris and Neosho rivers and the lower end of Labette Creek.